“A 50% reduction for a single appeal is highly out of the ordinary. In my opinion, the AAB reached the wrong conclusion,” [County Assessor Larry] Stone wrote in a statement. The tax dispute is a bit convoluted too, but apparently focuses on whether the 49ers owners the York family should be taxed on only half the value of their free use of public land (because they only control the stadium six months out of each year) or whether they should be taxed on the full value (because the six months they control the stadium includes football season, which is kind of the only time you want to operate a football stadium). The Santa Clara County Assessment Appeals Board ruled in favor of the Yorks, who will now get to cut their annual payments to the local school system by $6 million, which in present value comes to around $90 million worth of savings. The backstory, of course, is that the Yorks built their new stadium back when the team was still good and fans weren’t afraid of broiling to death in the South Bay sunshine, and now significantly less people want to go see games there. Not that it really matters much — they already suckered fans into paying for most of the construction costs with personal seat licenses, and it’s not like they would likely be happily paying their tax bills if only the team were more successful. But it is a good reminder that when the going gets tough, the tough usually try to find a way to stick someone else with the bills. Representatives for the 49ers countered that the team has been giving the city regular reports and has lived up to its end of the deal. They said the team is withholding information in two areas it considers confidential: security plans and financial information related to non-NFL events. Making security information available would put the public at risk, while disclosing the details of the non-NFL events would damage ManCo’s ability to effectively negotiate with promoters such as LiveNation and AEG Live, the team says. [Tom] Addison wanted out after the 2015 season. He wanted to sell what the team called his Stadium Builder Licenses so he did not have to keep spending $5,000 annually for four season tickets in the corner of an end zone, a requirement to maintain the licenses. Which, you know, there’s that thing that P.T. Barnum never said about suckers — plus, about half of the PSLs were bought up by ticket brokers, who will just write this off as a bad bet. Still, with things so bad that 6% of all PSL holders have just defaulted on their annual payments and walked away with nothing rather than have to keep plunking down money for tickets every year, you have to wonder how eager, say, Los Angeles Rams fans will be to put down cash for PSLs once those go on sale next year. 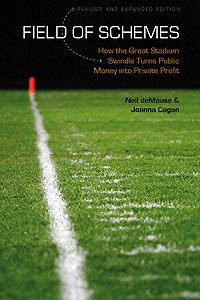 The argument here, as I understand it, is that the 49ers’ contract requires them to itemize spending of city dollars (one possible misuse of public funds was for reseeding the famously problematic field, according to an audit presented to the city on Thursday), so if they don’t provide the documents, they’re in breach of contract, and Santa Clara can take over management of the stadium. That doesn’t seem likely to happen — 49ers execs said they’d provide the missing budget documents by today — but it’s certainly an interesting way to force more transparency. The real test will come if those documents show questionable uses of city funds, and Gillmor demands that they be repaid by the team; stay tuned for much more bookkeeping excitement, I’m sure. There is a throwdown going on between Santa Clara Mayor Lisa Gillmor and the owners of the San Francisco 49ers about whether the team is using general fund money for stadium costs, and both the total amount of money (maybe a couple hundred thousand dollars) and the details are fairly trivial, but since it’s being talked about: The 49ers pay the city $170,000 per game for police and fire department costs, and when the city sends more officers and firefighters to a game than that, they’re supposed to bill the team. But they haven’t been, or the team hasn’t been paying it, or something. It hardly seems worth the $200,000 audit that Gillmore has ordered, to me, but if that’s what it takes to get the accounts receivable department in order, okay then. The interesting bit here is that Santa Clara is even getting to make a stink about proper payment of police and fire overtime, since very few other teams pay for these costs at all — they’re a big part of why Judith Grant Long found that unreported stadium costs typically inflate the total public price tag by about 40%. So really, this isn’t so much a sign that the 49ers are ripping off the public (though they might be, in a very, very small way) as that the deal that Santa Clara cut protects taxpayers to a degree that’s unheard of in much of the nation. California really is a different world for stadium and arena deals, at least if you don’t count Sacramento as part of California. Why is it that just when you’re about to go and declare a new stadium a rare financial success for the public (or at least a rare non-sea of red ink, even if there may be numerous other problems), the team’s owners have to go and ruin it by asking to renegotiate the deal once the place is up and running. Seriously, what’s the deal, San Francisco 49ers? The Niners agreed to $24.5 million per year for the first two years, but its contract provides a one-time “rent reset” — adjusting the rent based on changes in revenue, updated development costs and expenses. The thing to remember here is that the “rent” involved isn’t actually rent: It’s actually money that the 49ers owners are paying to the Santa Clara stadium authority that the authority will use to repay money that the 49ers loaned to the authority to pay off bank loans for stadium construction that the team took out but the authority is paying for. (If you didn’t understand all that, don’t worry, that’s really only for the tax lawyers to comprehend.) So this is all just a complicated Rube Goldberg scheme for the 49ers to get a federal tax break on paying off their own construction debt. The Santa Clara stadium authority, equally reasonably, is saying that they’re not sure yet what the cash flow is going to look like, so please make your full rent payments so we can balance our budget, and if there’s any left over, we’ll write you a check for the difference. Which the 49ers then agreed to do, sending over a pair of checks worth $5.5 million. So … what’s the big drama here? Nothing, really, unless abstruse accounting gimmicks are your cup of tea. The rent squabble is just a matter of how the team will pay off its loans — which is a headache for some Santa Clara bean counters, I imagine, but nothing that taxpayers should be worried about. Everything else that’s dysfunctional about Levi’s Stadium is another story, but at least if Santa Clara got a stadium where fans broil, the turf is a disaster, and the team is awful, they’re not stuck with a bill for it as well.